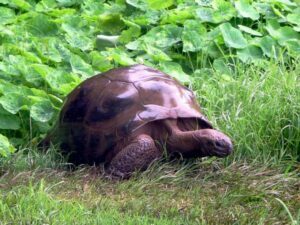 Though humans are known to live longer than most animals do, there are still exceptions to the rule. 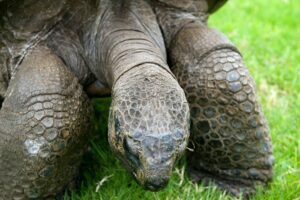 Today, we will be talking about tortoises who have a life span that will knock you off your feet. 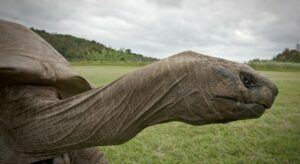 According to the experts, the following reptile is the oldest terrestrial being in the world. 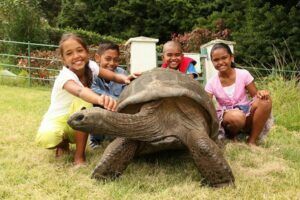 The tortoise named Jonathan lives on the island of Saint Helena and is an honorary member of the governor’s house. The creature was born in 1832. 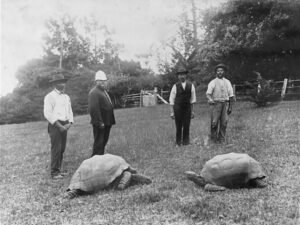 There is a photo of the tortoise that was taken in 1886, and though the modern pictures of him are also provided to see the difference, we think that Jonathan is the best candidate for the oldest living being challenge. 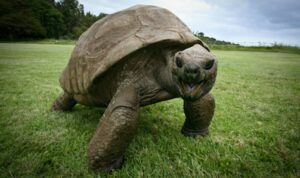 When the first image of him was taken, the scientists did not know that the tortoise would make a sensation on the media more than a hundred years after this. Though the caretakers say that Jonathan is still full of energy and thriving, he needs to be surrounded with attention all the same. 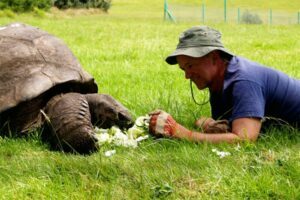 The doctor that is taking care of the tortoise claims that he has to consume special kind of food. The grass that he eats on a daily basis is not enough to nourish him throughout the week. Meet this adorable fellow below! Though it is common that humans outlive animals, the same cannot be said about the star of the compilation. 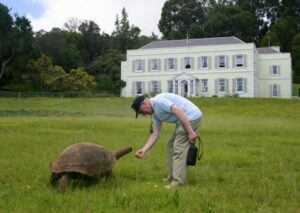 Jonathan is an unusual tortoise by all means. He is so popular among the tourists that it is no wonder that he has become a viral sensation. This giant proves that some animals have to be mentioned in the news due to their unusual appearance. 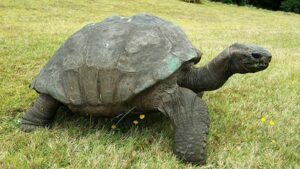 The creature is more than a hundred years old, and it is hard to believe that this is the real number! The island is glad to host a friend on its grounds. He has become a local celebrity that attracts visitors to the place. Jonathan is allowed to roam the island without any restrictions, but he prefers to reside with the governor at the plantation house. The photo below was taken in 1902, and one would be excited to compare it with the modern images! Even though the hero of the day is no longer young, he still remains active! The pictures you are going to see next belong to another era, and the fans are thrilled to learn more about the fellow. The doctors feed Jonathan a special meal because his digestion needs to be maintained in perfect order. Look at this cutie!